PORTSMOUTH, VA (BUSINESS WIRE) — “Trade Dollars used in modern trade and barter transactions among businesses participating in barter exchanges are a legal and robust form of commerce in America,” said Ron Whitney, Executive Director of the International Reciprocal Trade Association (IRTA). The U.S. organized barter industry was officially sanctioned by the Tax Equity and Fiscal Responsibility Act (TEFRA) of 1982 and signed by President Reagan. Recent media reports about Bernard vonNotHaus, who is awaiting Federal sentencing in North Carolina, seem to have caused confusion about barter. VonNotHaus, who was recently found guilty of making coins resembling and similar to United States coins; of issuing, passing, selling, and possessing Liberty Dollar coins; of issuing and passing Liberty Dollar coins intended for use as current money; and of conspiracy against the United States. VonNotHaus’ Charlotte-based lawyer Aaron Michel, who is appealing the conviction, attempted in Federal District Court to portray vonNotHaus’ private coinage as a form of private voluntary barter currency. He argued Liberty Dollars were a means to help keep currency in local communities by creating networks of merchants and consumers who used the money. Numerous organizations have experimented with local currency, but Federal laws restrict them from resembling U.S. bills or from being passed off as money printed by the Federal government, which vonNotHaus’ coinage resembled. The Government’s arguments in the case clearly substantiate the legality and validity of The Modern Trade and Barter Industry. 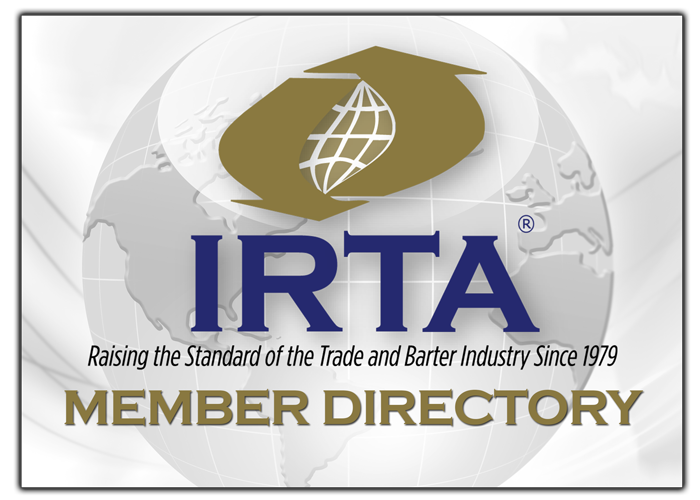 The mission of IRTA is to provide to all Industry Members with an ethically based global organization dedicated to the advancement of Modern Trade and Barter and other complementary capital systems, through the use of education, self regulation, high standards and government relations.